Inadequate early childhood development exacerbates inequality and reduces economic growth. If children do not reach their optimum development—socially, emotionally, physically, and cognitively—by the time they enter school, it could mean earning around one-quarter less in income as an adult. If every child in their earliest years receives the quality, affordable support and care to develop the learning and cognitive skills they need to reach their full potential, we can help level the playing field and set them—and our societies—up for a more equitable and prosperous future. The first few years of life represent the crucial window of peak brain development where more than 1 million new neural connections are formed every second. Yet, millions of children under the age of five—including 250 million in low- and middle-income countries—are at risk of falling behind in their developmental growth due to extreme poverty, lack of early stimulation and learning, poor nutrition, and exposure to violence and neglect. This is particularly true of those most vulnerable to the stress experienced in humanitarian emergencies and conflict settings, which can lead to physical, mental, and behavioral issues in adulthood. Even in developed countries such as the United States, a child who enters kindergarten unprepared is 25 percent more likely to dropout of high school and 60 percent more likely not to go to college. Children succeed when provided with quality nutrition, protective home environments, opportunities for social and physical exploration, and cognitive stimulation through positive play and responsive caregiver-to-child interactions. 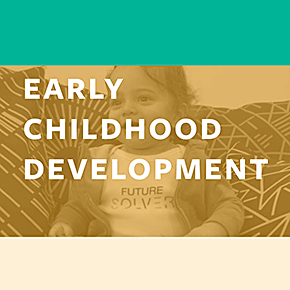 In fact, research shows 13 percent in societal returns when communities invest in comprehensive and high-quality early education for children under five. The time is now, and the responsibility is ours to guarantee all children in their earliest years receive the nurturing care, development, and learning they need for bright futures.